"From Danville to the World"
A Christian believes in the teachings of Jesus Christ, and is a person that follows Jesus with all his heart and soul. He believes that Jesus was born of a virgin (Luke 1:27), that He came to earth in human flesh a man (John 1:14), the Son of God (John 5:27) who came to seek and save the lost (John 3:17). That He was crucified and hung on a cruel cross (John 19:17-18 and died for our sins (John 19:30), placed in a borrowed tomb (Matthew 27:57-61). But, oh Hallelujah, three days later He arose (1 Corinthians 15:4). For it is by His grace that we are saved (Ephesians 2:8). Followers of Christ were first called Christians in Acts 11:26 because their behavior, activity, and speech were like Christ. Once Jesus was walking by the Sea of Galilee and saw Simon Peter and his brother, Andrew, who were fishermen, casting their nets. “Come, follow me,” Jesus said, “and I will make you fishers of men.” At once they left their nets and followed Him (Matthew 4:18-20). God asks us to make disciples of all nations (Matthew 28:18-20). 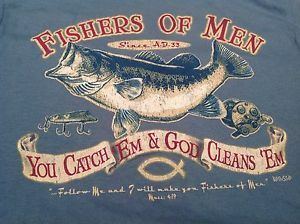 To be fishers of men. To follow Him. He asks that we no longer be children, but be men. (Ephesians 4:13-14). In order to follow, we must be equipped. We must take up the full armor of God, take up the shield of faith to block Satan’s army, and pick up the Sword of the Spirit which is God’s mighty breath (Ephesians 6:13-20). For without spiritual equipment, fishing for souls will be impossible, but with God, nothing is impossible (Matthew 19:26). Jesus will teach us and show us where to cast our nets. Are we listening? Are we learning? Are we teaching? Prayer is not an option; it is a must. I pray that the men of Mt. Zion will be followers of Christ. That we will be fishers of men, that we fish faithfully and boldly, and that the nets be filled. That we give you Lord, all the praise, all the Honor, and all the Glory (John 2:11). May we take up our cross, and follow Him daily (Matthew 16:24).